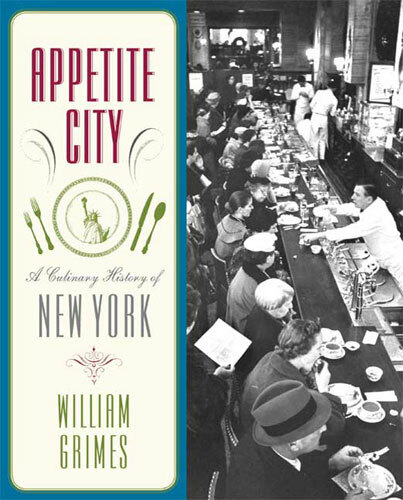 As someone who has spent years researching the history of restaurants I can give no higher praise than to say “I couldn’t have done it better myself.” That is my appraisal of William Grimes’ Appetite City: A Culinary History of New York (Farrar, Straus and Giroux/North Point Press), a book I highly recommend to anyone interested in the history of both restaurants and New York City. And, though I might have matched the book’s exhaustive research, I doubt I could have written it so engagingly. I appreciate Grimes’ level gaze and ability to sidestep the hype that has always surrounded New York restaurants, even as far back as 1825 when a journalist insisted that New York rivaled Paris with its “consummate institutions for cultivating the noble science of gastronomy.” Grimes’ response: “New York a rival of Paris? Hardly.” Though its star would rise throughout that century and the next, there were plenty of dips along the way. In the late 1960s and early 1970s the city was depressed and “cultural energy no longer radiated” from it. California restaurants became the locus of culinary innovation. Inevitably, though, many of its leading chefs migrated to New York as almost everyone who wants to make their mark does at some point. Readers will find everything they are looking for in this book. All the leading restaurants and restaurant types are covered, in text and illustration: from Delmonico’s to the Automat, speakeasies and lobster palaces, beaneries and night clubs, oyster bars and world’s fairs eateries, from the 1820s to the present. I particularly enjoyed the book’s final chapter in which Grimes discusses his five years as a restaurant critic for The New York Times, during a “frenzied restaurant boom fed by a robust economy” (1999-2004) when “the dining scene was a complete free-for-all, as chefs dipped into Pacific Rim and Nuevo Latino with equal enthusiasm…” If I find anything missing in the book it is a characterization of New York restaurants which identifies how they have been, and are, different from those in the rest of the U.S., and the world — perhaps an impossible task, but worth a try. And something that applies to all capital/global cities that I would have liked to see would have been an attempt to separate the local dining spots (where the natives eat) from those that rely heavily on visitors to the city. But these are minor omissions in a valuable and thoroughly enjoyable book. 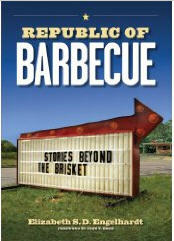 The Republic of Barbecue: Stories Beyond the Brisket (University of Texas Press) takes us far beyond New York City and its trendiness and glitz. Here we are introduced to more than one expects from a purely local tradition in cooking, eating, and restaurant-ing. The book is by Professor Elizabeth S. D. Engelhardt of the American Studies Department at the University of Texas at Austin and 11 graduate students. With cameras and tape recorders the crew explored Central Texas eateries to create an oral history of barbecue and answer the question, “What does barbecue tell us about who we are?” Proprietors tell in 23 first-person narratives how and why they barbecue. These are supplemented by essays by the authors which explore the area’s history as well as subjects such as gender and race. So the book sprawls, intentionally. As Engelhardt says, the idea is not to solidify Texas barbecue mythology but to find its complexities. Myth would have it that Texas barbecue is about beef and sausage; cowboys; rich and poor sitting side by side; eating off of butcher paper without utensils; slow cooking over mesquite and post oak in brick pits; no sauce; and only bread or crackers as sides. They find all of these things are real, but they also trace historical roots to Southern cotton culture rather than Western cattle culture; find decades of exclusion of blacks and Mexicans as customers; discover pork, chicken, turkey, goat, and mutton alongside beef; and find varied practices such as some barbecuers using sauce, some cooking on rotisserie pits fueled by propane instead of wood pits, and some cooking the meat for only three hours rather than twelve or more. The book is well illustrated and, though somewhat repetitive and a bit inconclusive, filled with fascinating essays and narratives. I enjoyed reading about what to drink with barbecue – Big Red and Dr. Pepper sodas, and Shiner Bock and Lone Star beers. I appreciated Gavin Benke’s “Authenticity” which explores issues such as the restoration of butcher paper for the feel of the “real barbecue” experience, Eric Covey’s “Keep Your Eye on the Boll,” which examines barbecue in the context of a cotton-growing economy, and Remy Ramirez’s essay on her Mexican-American grandparents. The book is nicely produced and a pleasure to read and a must-have for anyone interested in barbecue or restaurant history and culture. These books sound interesting — I’m glad Cynthia introduced me to your blog today. I’ll keep reading. Can’t wait to read Appetite City myself, and since I live in the Republic of Barbecue Exiles here in New England (my Texan neighbor is a wicked smoker of briskets), I’ll urge him to drool over the second one. Or pine away for the warmer and spicier climes. Thank you, thank you Jan! I’m always on the look out for a book that gets right down to the meat and bones of New York City’s legendary eating establishments. I’ve added Mr. Grimes’ book to my ever growing list of wish books.